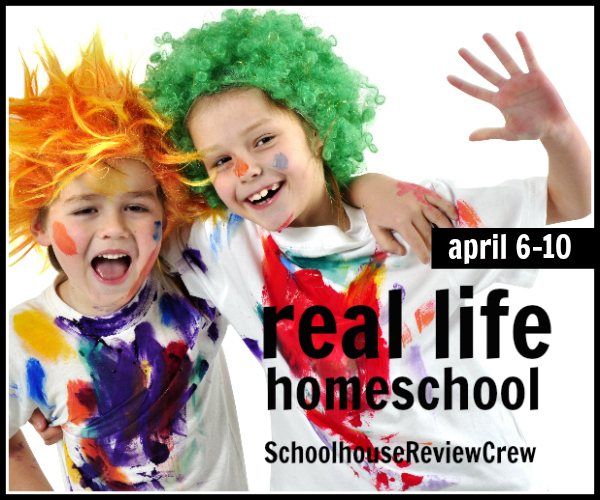 It’s Day 2 of the Real Life Homeschool Blog Hop! Yesterday we talked about our flexible homeschool schedule. 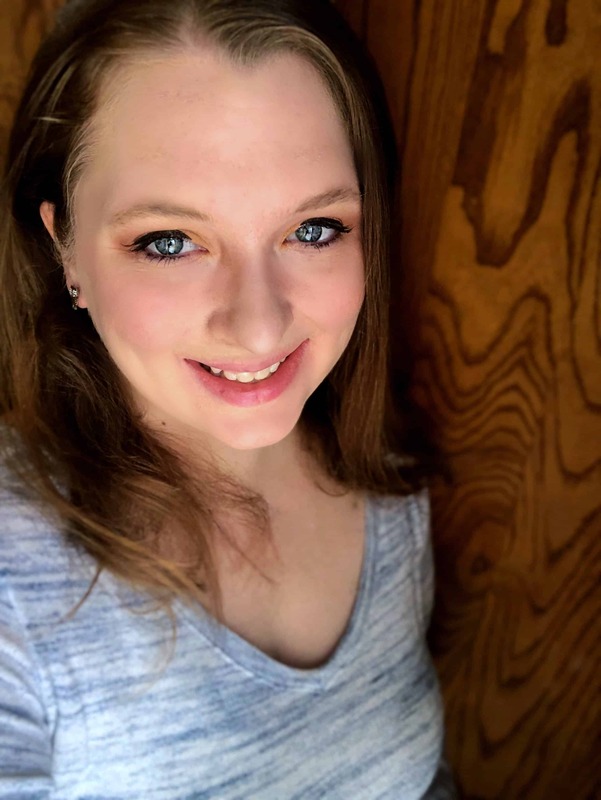 Today I am going to talk to you about homeschooling with a newborn and a toddler. We welcomed our fourth little baby late January. As I said before, my oldest is six and we have definitely gotten serious about school this year. I’ve had to do a little rearranging with the way we did our work and my expectations. On top of that, we also have a little two year old in our homeschool and we have to learn to work with him, too. 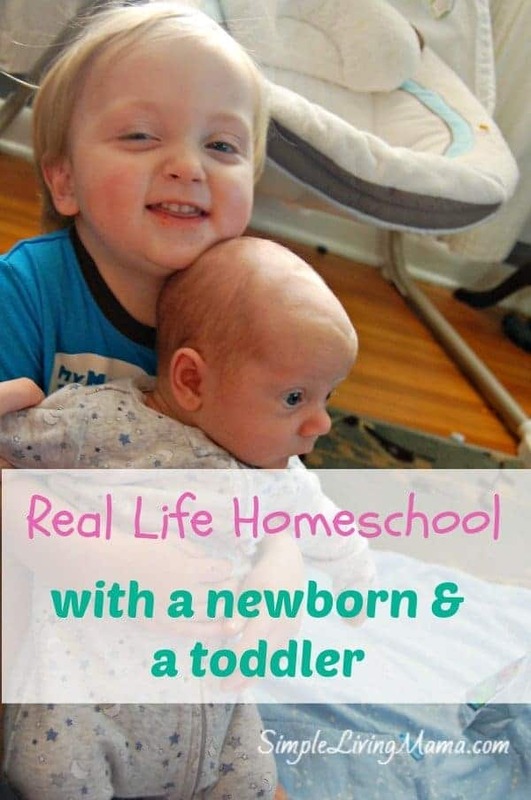 First, let’s talk about tips for homeschooling with a newborn. While you are pregnant, plan to take at least two weeks off from school after you have the baby. You need to adjust to having a new little one to care for and your kids need to adjust to a new sibling. Let this time be about family bonding. Your kids will still learn lots of valuable lessons during these couple of weeks. Let them help you with the baby! Then, slowly ease back into schooling. You don’t have to be supermom. Skip the crafts and the big projects for the first few weeks. 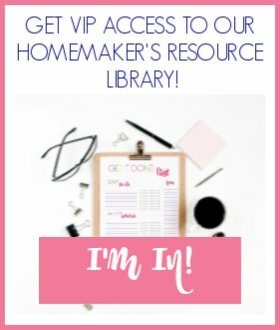 We tend to follow a Charlotte Mason approach in our home, but I’m not above using simple workbooks. Also, my older kids love to make up their own projects, so I let them. If you get nothing else done during the day, read a book to your kids. It’s easy to do when you’re feeding baby or baby is napping. Now here are some tips for homeschooling with a toddler! Create preschool boxes for your toddler to use while you school your older children. Your toddler will be occupied for a little length of time while you do one-on-one with an older child. I let my two year old do activities with us. If we are painting, he gets to paint, too. He has his own pair of safety scissors and will cut up paper while we do a cut and paste page. He sings song with us and just participates as best he can. This is real life homeschool. Activities will only occupy a toddler a certain amount of time and chances are it won’t be long enough. My six year old has learned how to do some of his work with the nose of a whiny toddler in the background. He has had to deal with interruptions while I try to corral the toddler. We don’t typically do school while the toddler naps. That does work for some homeschoolers. We have just learned to go with the flow, and yes, there are days when everyone’s attitude gets so bad we just bag it for the day. This is really helpful and timely, thank you! This was a suggested pin on Pinterest. It was so so the right time. I just vented to my FB homeschool group yesterday about just this. I have a 4th grader, toddler & 5mo. Finding that perfect balance we had pre-baby is relentless. Thank you for your words of encouragement. I’m so glad this post was helpful to you, Amanda! I will be going back and re-reading my own advice come April when #5 joins us. Joanie, Good thoughts! As a veteran Homeschooler, I would even suggest a longer break than 2 weeks. Maybe 2 months 🙂 It doesn’t mean no school is happening! When you’re reading to your children, you’re doing school, as you said. When you’re talking about the places mentioned (Geography and Social Studies) or the animals, etc., you’re doing school. When your 6-year – old helps set the table, and you ask him how many more spoons he needs, and he counts how many he has and figures out how many more he needs, you’re doing Math! (btw, read Ruth Beechick’s little book, 3Rs, where that idea came from). I encourage you that so much learning is happening when you’re just living life. Take it slow and enjoy these days with little ones. Especially a newborn:) Find a veteran Homeschooler empty nester who loves little ones, like me, near you, to come and read and spend time with your kids and give you a break. Blessings on your new little one and your precious family. Wendy Gunn recently posted…Are You Sure the Anger and Tears are PMS not MSG?